I was definitely up for checking this out because, well, Narcos totally has us hooked on anything pertaining to Pablo Escobar at the moment, and not to mention Bryan Cranston being a huge draw on his own. Back in the drug game? All aboard! I was pleased to see John Leguizamo in here, as I quite enjoy him, and Diane Kruger provided a solid performance, too. The performances were all quite good, although there were a lot of characters who were skipped over. 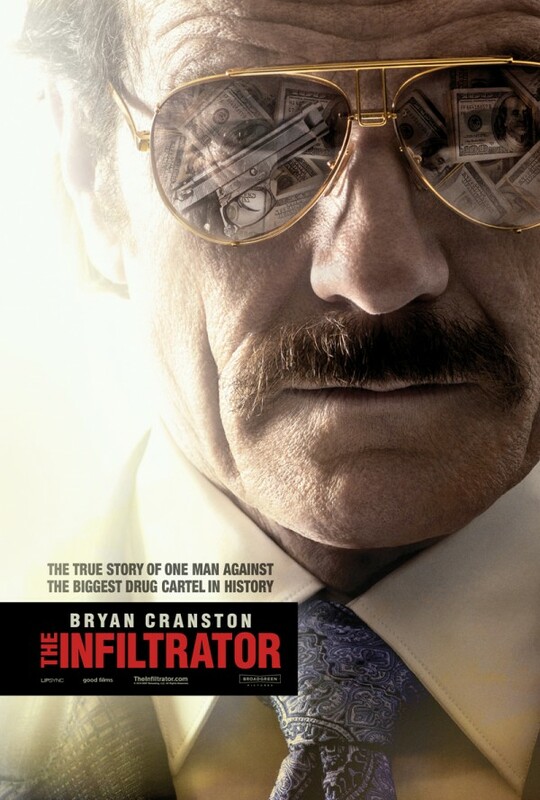 The Infiltrator gives you the information you need for the movie in the setup, and then runs with the sting. My biggest issue is that, while this was good, it missed its chance to be great. All the potential was there, but the movie played it too safe and didn’t go for the guts. I was a fan of the way relationships were depicted in this, giving the viewer a look at how a situation can get sticky when you are undercover because you really can end up liking the people you are investigating, so situations are not always ideal, and they do have crazy effects. The biggest issue is that, while the cast was good, one would expect more about Escobar and his insane cocaine cartel, and the plot never really went all in, and the vestment of Mazur getting bust were relatively low. The poster makes it look like this guy went up against Escboar and survived, when in reality it was very little of that. The movie had the potential to pack more punch than it ultimately went for. This means that the movie is good, but it never hits the highs you want for it. Worth a look see, at any rate. This entry was posted in Movies and tagged Bryan Cranston, Diane Kruger, John Leguizamo, movie reviews, movies. Bookmark the permalink. Ha! I love the freeze-frame image of Cranston in that trailer. 😉 Perfect summation of his experience. I really enjoyed this one. (Cranston of course!!!) I also appreciated how Escobar was kept out of frame for the most part, for me it kind of lent this idea that he was so freaking big, he became basically mythology. Him not having really a part at all in the narrative reinforced how hard to touch he was. That’s jut me though. My issue is that it is made out that there is so much Escobar, and then nothing. It was jarring like that. Otherwise, overall, I thought the movie was really good and rather interesting. Glad you liked it, too! It’s entertaining, but ultimately pretty conventional. All that really kept it going for me was the ensemble. Nice review. Agreed, fun but nothing spectacular. Thanks Dan!